A single serve bottle of the traditional Italian Cocktail, Bellini, made from Prosecco and Peach Puree. Fruity, free from additives and naturally low calorie! Invented in Italy by Guiseppe Cipriani, founder of Harry’s bar in Venice. 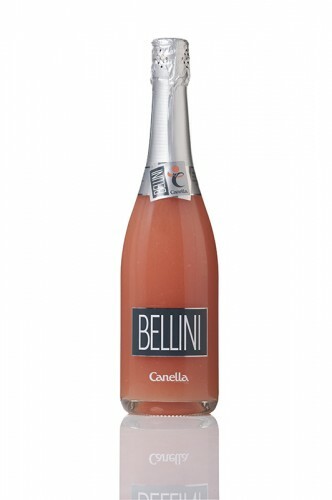 Traditionally made from Prosecco and Peach Puree or nectar, the Canella family produce their Bellini from approximately 9,000 white Peach trees grown in their orchards in and around Veneto, blended with a few drops of wild raspberry juice to give its unique pink colour. The drink started as a seasonal speciality at Harry’s Bar, a favourite haunt of Ernest Hemingway. With modern methods, it is now available throughout the year as an ‘any time’ cocktail. Enjoy this refreshing fruity, naturally low calorie drink, bottled without added preservatives, sugar or artificial colouring. Perfect for picnics. Served chilled with friends! Perfect for Hen Parties!